StainlessDrains.com manufactures a full line of custom shower trench drains for a variety of industries. With its sleek and contemporary design, the stainless steel shower trench drain offers beauty, durability and pathogen-fighting protection. Constructed out of 304 or 316 stainless steel, our shower trench drains help maintain sanitary environments due to the corrosion-resistance properties of stainless. They provide a lifetime solution for any application, reducing unnecessary maintenance costs. 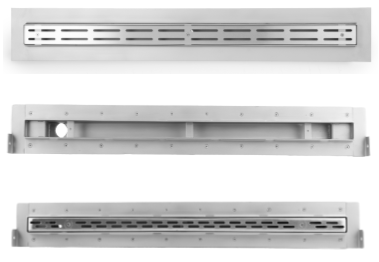 This easy to clean and easy to install linear drain can be customized to meet your specific project needs, including a customized grate. Custom engraved or color printed grates help create a unique and exclusive look for your home or facility. Designs will not affect the durability of the grate itself. Shower drains meet U.S. FDA standards. For use in residential and commercial applications. Stainless steel shower trench drains are ideal for hotels, multi-family properties, healthcare facilities, fitness centers, locker rooms, schools, resorts and spas, public shower areas (pools and parks) and in custom homes.